Usually I enter information about packaged gluten free products only on the “Packaged and Frozen Foods” page, but I thought these cookies were so good that I wanted to highlight them with a post. 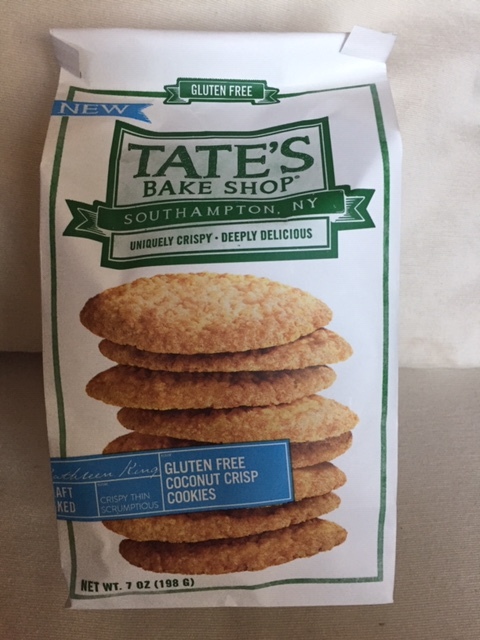 Tate’s Bake Shop has several great cookie flavors (Coconut Crisp, Oatmeal Raisin, Ginger Zinger, Chocolate Chip, and Double Chocolate Chip), plus some cookie-related products (glass or ceramic cookie jars, and a gift cube). The cookies are wonderfully crisp, and would please any cookie-lover, whether gluten free or not. I found them at the Heinen’s in Barrington, but if they aren’t available in your local grocery store, you can order them directly from the company or buy them on Amazon. Their gift baskets are packaged with other yummies. These would make a wonderful holiday gift to a business friend, a housewarming or a hostess gift. This entry was posted in Prepared foods and tagged cookies, gluten free, gluten free cookies, Tate's Baked Shop on October 20, 2018 by goforsix. Last night, my husband and I were going out for dinner, and there was too long of a wait where we started out, so we pushed on to try a restaurant that had been recommended by our daughter. In Crystal Lake, 1776 offered great menu in a tastefully appointed restaurant. Although we don’t frequently drink wine, their selection was extensive, and award-winning. The room was a bit dark, so I don’t have photos to share, but the dinners were quite delicious and artfully presented. My husband chose the jambalaya (the seasoning was just right), and I had the daily special, grilled scallops. A real bonus – the room is not too noisy for conversation. More and more, that has become a consideration in our restaurant choices. It was only after our dinner that I was checking reviews online, and I found out that the owner of the restaurant is celiac, so is very attentive to menu options that are gluten free. I hadn’t even asked about this when we were ordering, since I had a bottle of Glutenease with me, so I had planned on having the table bread. Have any of you been introduced to this product? I had been told about it by a friend several weeks previously, and have been experimenting occasionally. I haven’t been disappointed yet. I can eat table bread and regular pasta. I need to discuss it with my physician. I highly recommend 1776 for a fine dining experience. We plan to go back again soon. This entry was posted in Uncategorized on September 19, 2018 by goforsix. I’ve been gluten free for about five years now. Early on, I was trying different products, and found a number of them very disappointing. Case in point, gluten free bagels. The ones that I tried several years ago were so disappointing. It’s a bit trite to say they tasted like cardboard, but that’s a pretty good description. I lightly toasted the bagel halves and had bagels with lox and cream cheese, and I loved it. Very satisfying. So – thank you Trader Joe’s. You really delivered. This entry was posted in Prepared foods and tagged avocado toast, bagels, Fearless Flyer, gluten free, gluten free bagels, grocery, lox, prepared foods, Trader Joe's on February 15, 2018 by goforsix.